Shaft Switching! Doesn’t that term sound complicated and scary? Yet over and over we hear that it’s a very simple way to diversify your designs. Members Leslie Ardison and Amy Stevens will explain the mystery of this technique, invented by the legendary Peter Collingwood. Social and library time at 7pm, meeting to start promptly at 7:30. 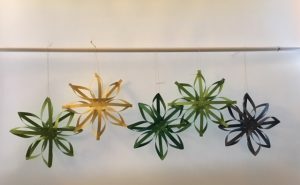 Meeting to be held at The Fiber Loft. This show is going on at Western Avenue Studios in Lowell until the end of the month. If you go, check out the pieces by Ann Ribbens. She is my neighbor, and told me about the show. Anyone interested in a field trip? The Loading Dock Gallery is approaching the month of March with an adventurous spirit! Fiber and Textile artists, hailing from New England, explore materials and concepts that are so inspired, unique, and attractive to the senses, the exhibition had to be entitledFiberlicious! 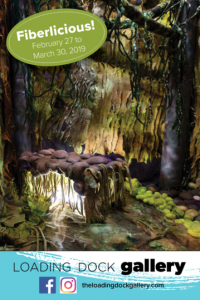 Experience the joy of fiber-play that visually and tactilely push artistic boundaries. Ponder artistic pieces that challenge the senses utilizing fiber/textile inspired 2D, 3D, video or digitally-generated pieces and wearables, often offering commentary and are brilliantly unexpected. 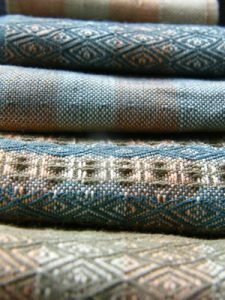 Please mark on your calendars this year’s dates for NEWS (New England Weavers’ Seminar) that will be held at Smith College in Northampton, MA from July 11-14, 2019. 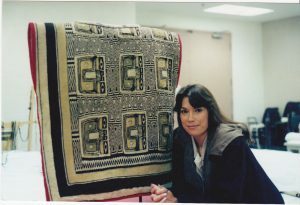 The website is: www.newenglandweavers.org. Please open the website and click on the 2019 Conference link, then scroll down and you will see the various workshops, events, and registration. ONLINE REGISTRATION BEGINS ON MARCH 10th AT 2:00 PM. Happy Weaving! There is a warping mill (~40 inches in length – horizontal) for sale in Harvard – appears to be in fine shape, 50$. I am thinking this is a good idea and hassome good advantages over a warping board. 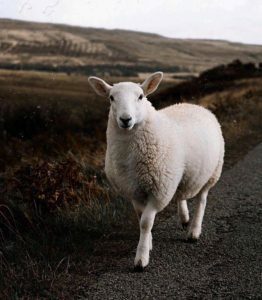 Your thoughts please? Mill No. 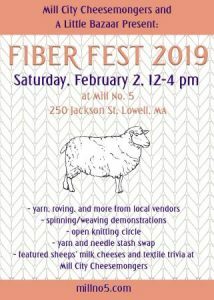 5 Fiber Fest this Saturday, 02Feb2019! Hi Everyone! This Saturday is the inaugural event for Mill No. 5’s Fiber Fest. A few NVWG members will be helping out in the demo area. Anyone else want to join us? Sunday 27Jan2019 is Farm Fiber Day #1 @ the Wayland Winter Farmers’ Market!